While snowboarding has been taking the plaudits during the course of the past 15 years for making winter sports cool, tele-skiing, or Telemark, has been quietly getting on with the business of slowly but surely attracting more devotees. True, it may not have the flash and dash of its more flamboyant companion, but for those in search of something more, either on- or off-piste, then it is well worth trying. But before deciding whether Telemark is for you, there is the crucial question; exactly how much is this going to cost me? Sadly, there is no escaping the fact that you will need to invest beyond the standard equipment that you already possess, so budget in the region of at least £500 for skis, boots and bindings. 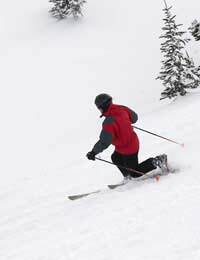 There is, for example, a comprehensive range of skis that have specifically designed for Telemark practitioners. The manufacturers talk big about performance characteristics related to the shape and flex of a particular model as well as the width, and the size of the sidecut. Lost already? Well, the bottom line is that you’ve got to ensure that you purchase from a specialised store staffed by individuals who can translate all the baffling product information and point you in the direction of a good carving ski that is right for you. The same is true for bindings. Telemark often goes by the popular name of free-heeling i.e. only the front of the foot is secured, so naturally a traditional alpine binding that holds in place both the front and back of the foot is not going to be appropriate. So it’s time to ponder the pros and cons of neutral and active cabling as well as toe-piece design. Free-pivoting touring is another feature together with the New Telemark Norm (NTN) system that can only be used with compatible boots. Again, don’t be afraid to ask questions: ski equipment doesn’t come cheap, so you must ensure that you walk out of the shop with the right model for you. When it comes to boots, lightweight, durable plastic is the order of the day thanks to advancements in technology. But as with all footwear, resist the temptation to be dazzled by the space-age design and garish colour schemes. Instead, think practical. Principally, that means getting the boot that is the right fit for you. Take into account the terrain you aim to be tackling, too. If you want to explore mountain terrain rather than remain on piste, then a boot with a shorter cuff and less buckles will be more suitable. Be sure to provide the store assistant with as much information as possible in order that they can pick out the right pair for you. The same rule applies to poles. Alpine poles are shorter than those used for cross-country, so if you are not planning to roam off-piste, then your existing models should suffice.When it comes to passing through the check-out it is likely that your credit card will let out at least a small cry of anguish. But every skier is well aware that when it comes to safety, cutting corners on equipment never pays off. Don’t forget either that the thrills of getting up to speed with Telemark will more than compensate for the initial financial outlay.